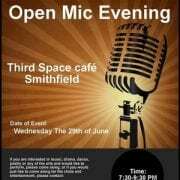 The Dublin Simon Community will be holding an Open Mic Night in the Third Space Café in Smithfield, Dublin 7 on Wednesday, June 29th from 7.30pm to 9.30pm. The event is open to the public and anyone is welcome to put on a performance, read a poem, sing a song or anything at all on the night. You can even just come down to engage in the conversation and entertainment! 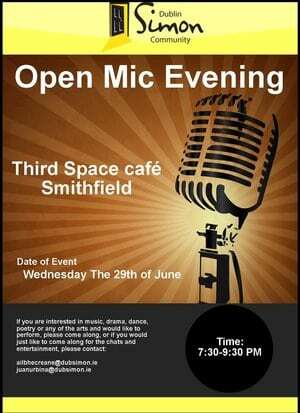 There will even be some performances on the night from clients of the Dublin Simon Community. It promises to be a great night and all in aid of a great cause. Third spaces are places for local people to gather and eat easily, inexpensively and regularly, with space for creative, cultural and community activities. Keep an eye on the Third Space Facebook page for more events throughout the year, such as; music evenings, lectures, the “Square Meal” and much more. You can even enquire about using the Third Space Café for your own event or group gathering. Book clubs, knitting groups, film societies, dramatic performances, art exhibitions, table quizzes, writers’ forums and parties are just some of the things that have happened in the space in the past.